Wilhelm von Bode studied Law at the Universities of Göttingen and Berlin but never graduated. In 1872 he was engaged as an assistant at the Scupture Department of the Royal Museums in Berlin. In 1883 he became the director of that institution and in 1890 the Gemäldegalerie (Gallert of Paintings) also came under his supervision. In 1904 he opened the Kaiser-Friedrich-Museum, now well known as the Bode Museum (it was renamed in 1959). In 1905 he became General Director of the museums in Berlin. Allthough his budget was often limited he managed to buy spectacular works. He held his position until his death in Berlin in 1929. 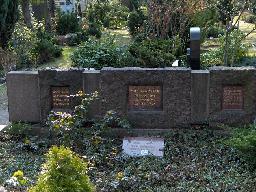 The grave of Wilhelm von Bode at the Evangelischer Luisenfriedhof II, Berlin.